We're not the only ones preparing model soldiers for the Anzac commemorations this year. 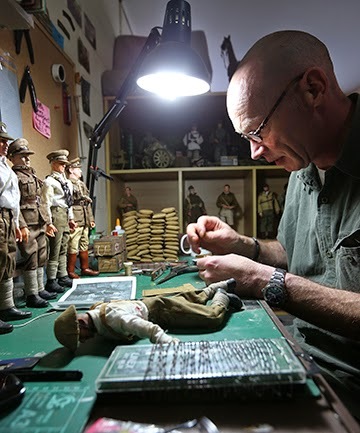 The Southland Times recently reported on Bob Hartsuiker, a model-maker who has been commissioned by the Southland Museum and Art Gallery to provide models and a diorama for an upcoming exhibition to commemorate 100 years since the Gallipoli campaign. Hartsuiker usually makes World War II replica models, making everything other than the figurines themselves, and their boots, by hand - from their berets to their tiny kit bags and their even tinier buttons. Now he has turned his considerable talents to making models of World War I. He has been doing plenty of research to make sure he gets the details just right, including watching the movie Gallipoli, starring Mel Gibson, and conferring with historian Dr Aaron Fox of the University of Otago. Or visit Bob Hartsuiker's website. Roly - your Read More link is busted. His miniatures look utterly fantastic. Thanks, Brian - I've corrected the link. I also added a link to Bob Hartsuiker's website - some incredible modelling to be seen there!